Many fields with a great amount of depth, like web design and development, have a split of service providers. Some offer specialized services while others focus on a more general area. Having done both myself, I think there are merits (and detriments) to each, although I certainly have my own opinion about what works best! But before we get into that, letâ€™s take a look at the match up. They are experts in their specialty. They know the work inside and out, upside and down. They may have an easier time selling their services once they find their market. Their work process is streamlined. They have no â€œfillerâ€� services to pick up the slack when work slows. Their market may be too narrow for consistent income. They probably have to turn down or outsource a lot of work. They limit their ability to expand their business. They risk going out of business if their specialty becomes obsolete. The generalist may consciously choose to offer a broad spectrum of services, or they may not have been able to develop expert-level skills in one specific area. Generalists may be very good at doing many things, but typically are not at the same expert level as specialists at any one service. They are able to market to a broader audience. They have more services to offer current and past clients in order to generate additional work. They can easily add, remove and update service offerings to match the market. They have broad peripheral knowledge, which may be enough for some clients. They can provide clients with alternatives if one solution is not a fit. They probably have to turn down or outsource specialized work. They have more to juggle in terms of project management. Their rates may be lower. Specialist vs. generalist is like comparing the coffee selection at a warehouse club and then going to a gourmet coffee shop. One gives you a selection; you can make a choice and pick a coffee thatâ€™s within your budget. The other is only for the serious coffee drinkers who know what they want and are willing to pay a premium for it. The warehouse club has a lot more traffic and sales. The gourmet shop is a harder sell, but a bigger one. There are advantages to being in both groups, but I think the only way to be truly successful is by being a little of both. You can be a specialist, but in order to be able to develop a profitable business (of course, depending on what your specialty is), you may need to be able to supplement your specialty services with some add-on services that may not be exactly in line with your focus. On the generalist side, you canâ€™t just do everything mediocre. You can offer a lot of services, but you need to do all of them well and some of them perfectly. If youâ€™re not at least doing them well, it may be time to consider not offering those services. Anyway, thatâ€™s my take. Whatâ€™s yours? 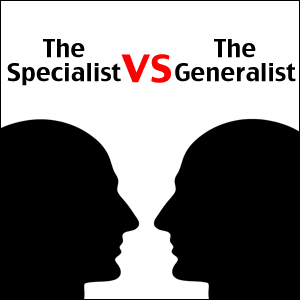 Are you a generalist or a specialist? Or a mix of both?